Details about LAPTOP KEYBOARD FOR LENOVO F31, F41 N100,N220,N200,C100,V100,N430,G430,N440,Y330 - Clublaptop - The largest online store by Manufacturer of Laptop Accessories and Spares. This replacement keyboard is made from highest quality parts and is 100% comparable to Original keypad in all terms including its size, appearance and most important QUALITY. Each keyboard is 100% quality tested before shipping, so you can be rest assured for its quality, durability and performance. This replacement keyboard is 100% compatible with the below listed model/part numbers. A reliable and cost-effective laptop keyboard replacement solution. For more information on product Call us at 09331393940 or mail us at rceretail@gmail.com. All prices are inclusive of VAT. Octroi or any other local govt. charges, if applicable has to be borne by the buyer & paid directly to the courier delivery person. In case of returns due to any reason, the return courier charge has to be borne by the buyer. Please check the content of the package before signing the courier receipt, else we are not responsible. All our package are insured & once you sign the receipt, the insurance stands null & void. Breakage or Content related issues have to notified to us immediately, but before signing the the courier receipt. No claim will be entertained, once the receipt is confirmed with a signature or stamp. Dealers Welcome for Orders in Bulk (All Other Laptop Parts Available). FOR ENQUIRY PLEASE CONTACT @ 09331393940 (Mon - Fri : 10am - 7pm; Sat : 10am -4pm, Sunday Closed) or mail us at rceretail@gmail.com. Product Title This replacement keyboard is made from highest quality parts and is 100% comparable to Original keypad in all terms including its size, appearance and most important QUALITY. Each keyboard is 100% quality tested before shipping, so you can be rest assured for its quality, durability and performance. This replacement keyboard is 100% compatible with the below listed model/part numbers. A reliable and cost-effective laptop keyboard replacement solution. 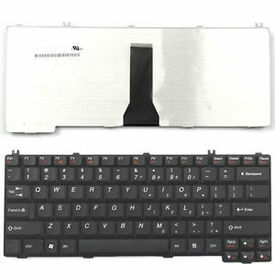 Replacement Laptop Keyboard Features > Made from high quality parts > QC of 100% products before leaving factory > Original like finish > Ribbon cable included > Excellent service > Safe and attractive packing > 100% compatible with original keyboard Product Features Product Code LKP LEN N100 Letter English Layout US Condition Brand New Replacement Laptop Keyboard Color Black Warranty 3 Months Replacement Warranty Compatible Keyboard Part Numbers:- 25-007696, 42T3338, 39T7321, 39T7385, 39T7417, 39T7353, 42T3338, MP-05663US-3871, 42T3403 Compatible Laptop Model Numbers:- 3000-C100 3000-C200 3000-C460 3000-C461 3000-C462 3000-C466 3000-C467 3000-F31 F31A F31G 3000-F41 F41A F41G F41M 3000-G230 3000-G430 3000-G450 3000-G455 3000-G530 3000-N100 3000-N200 3000-N220 3000-N430 3000-N440 3000-N500 3000-V100 3000-V200 V450 V550 series WARRANTY : 3 Months Replacement Warranty* For more information on product Call us at 09331393940 or mail us at rceretail@gmail.com. All prices are inclusive of VAT. Octroi or any other local govt. charges, if applicable has to be borne by the buyer & paid directly to the courier delivery person. In case of returns due to any reason, the return courier charge has to be borne by the buyer. Please check the content of the package before signing the courier receipt, else we are not responsible. All our package are insured & once you sign the receipt, the insurance stands null & void. Breakage or Content related issues have to notified to us immediately, but before signing the the courier receipt. No claim will be entertained, once the receipt is confirmed with a signature or stamp. Dealers Welcome for Orders in Bulk (All Other Laptop Parts Available).FOR ENQUIRY PLEASE CONTACT @ 09331393940 (Mon - Fri : 10am - 7pm; Sat : 10am -4pm, Sunday Closed) or mail us at rceretail@gmail.com.